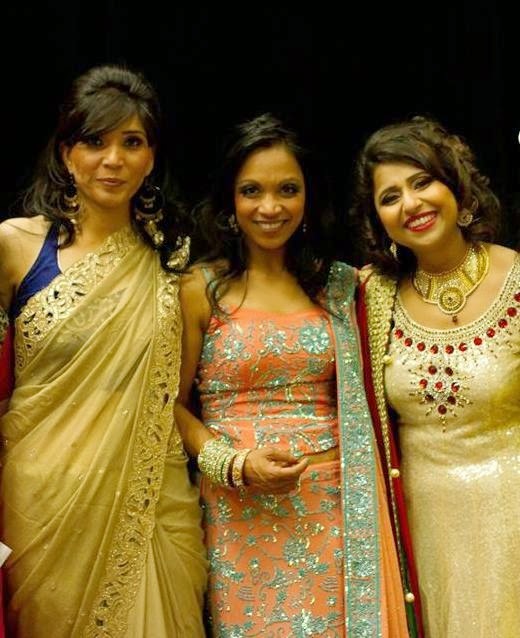 Home / Fashion / Mrs INDIA Washington - Behind the scenes ! Mrs INDIA Washington - Behind the scenes ! All the 12 married ladies contesting for Mrs. INDIA Washington and 6 young, talented girls contesting for Miss. India WA are all captured in the above picture. Each one Unique and Beautiful in their own way. Miss contestants were students, few who also worked part time. In Mrs, few were working professionals, working moms and others were homemakers. Some of us were performers, yes they gave live stage performances in and around Seattle. Three of them are trained classical dancers and another is a Singer. One is a popular Baker, who bakes eggless fancy looking cakes and another is learning to bake. One lady is a licensed physiotherapist and another is a teacher, who also worked as an interior designer. One works in an boutique and another is a captain of ladies cricket team. Our practice sessions were usually scheduled from 7pm to 9pm, few days they would go on till 10pm. I must applaud the energy and dedication of all these women who not only worked but also managed their household chores and kids. I don't have kids but can only imagine the efforts put by these wonderful ladies to manage family, work and evening practices. It was an competition but strangely it never felt like we were competing with each other. There was always a positive spirit in each one of us. We all enjoyed supporting and encouraging each other. We would give our honest opinions and constructive feedback and help one another. I saw in each one of us, the excitement and nervousness to walk the ramp. Yes it was different, right. We were no more young college girls but responsible married women. Each had their own insecurity but everyone recognized their weaknesses and worked hard to overcome and give their best shot at this beauty pageant. I attended an Holi (Fesitval of colors) event last month, met lot of new people, danced and had fun. World is indeed very small, little did i know then that audition for this beauty pageant will be judged by these two same ladies i met at the HOLI party whose name i never asked but took pictures with them and later as i checked they had mine. Nothing is a COINCIDENCE, everything is part of a larger plan. Our choreographers Manisha Malhotra and Rinku Jain worked really hard during our training sessions. They pampered us like their own and also did scold when and where it was absolutely necessary. They were extremely patient and dedicated towards the show. They also made sure each of the participant is comfortable and made sure we were giving our best. As a team we decided to do something for our organizer, an unique and passionate personality Menka Soni , our choreographers Manisha Malhotra and Rinku Jain , our awesome photographer Kiran Raibagi Kalburgie who made us look ravishing by her magical photography.So all the contestants prepared a dish and surprised them with an lavish extravagant pot luck party on the last practice session. They were pleasantly surprised and it was good for the team as well going into the contest with just 2days away from the big day. And off course its the most difficult task to capture the photographer herself, here is Kiran ! Making us all nostalgic! Beautiful memories down the lane. Waiting for more to read.... cant stay without visiting ur blog..seems like I'm addicted..! Nicely written blog... Keep up the the good work. Thanks for ur kind words. I applaud your groups sense of camaraderie. And you are right - each woman in the photos is beautiful! Thanks guys, for stopping by and appreciating our efforts ! Great Post...I can relate with the fun you must have had !